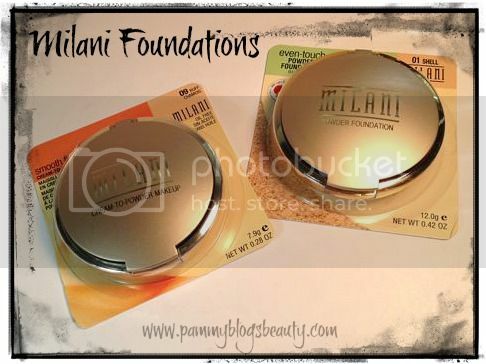 Pammy Blogs Beauty: The Foundation Fairy: Milani's Even Touch and Smooth Finish Foundations: New Shades! The Foundation Fairy: Milani's Even Touch and Smooth Finish Foundations: New Shades! Finding the perfect foundation can be difficult! This whole blog series, the Foundation Fairy, actually chronicles my quest for the perfect foundations for my Fair Skin. When I heard that Milani launched new shades in their Cream to Powder and Powder Foundation lines, I just had to scope them out! So back to the review! To find out how I like Milani's Smooth Finish Cream to Powder Foundation and Even Touch Powder Foundation, please keep reading. Milani's Cream to Powder foundation comes in 9 shades: Sand, Spiced Almond, Caramel Brown, Cocoa Mocha, Walnut, Medium Beige, Buff, Warm Spice (new), and Pecan (new). If you tried this line in the past and were unable to find a shade match for your darker skin tone, then you might want to scope out the new shades! I tested out the shade Buff which is a pretty good color for my very fair skin. Initially, when I looked at this shade in the pan I thought, "This is going to be way too dark and yellow for my skintone". So, I am surprised that I got this shade to work for me! When I apply lightly and blend it in, it actually melts into my skin tone surprisingly well. Also, I tend to top with a powder which helps to adjust the shade. The yellow tones in the product cancel out some of the ruddiness in my neutral-cool colored skin. I am slowly starting to realize that I seem to be one of those people that can literally pull off both warm and cool shades for foundations (depending on the brand). While the shade is just a touch too dark, it really does not leave any obvious demarcation line. With that said, I do use this product somewhat sparingly. So, I think it just blends into my skin and melts right in. I love the way this oil-free product makes my skin feel! I find this product to be very hydrating. My skin feels incredibly soft when I wear this. Quite honestly, I am new to cream-to-powder makeup! Previously, I would have thought this product to be too heavy for my skin type (which is normal-dry this time of year). I was wrong! I found this product to be just right! It hydrates, smooths my skin, and diffuses the look of my pores. Yay! A little bit seems to go a long way. I apply very lightly. I just dab a little bit on with my fingers on the areas that I need coverage: my chin, around my nose, a few random areas of my cheeks, and a dot on my forehead. Then I take my beloved Sigma F80 and blend it out. It is so easy and takes only a few seconds to apply! This product gives me all the coverage I need accept that I do need additional concealer for my very dark under eye circles. I finish this product off with a light dusting of translucent powder through my t-zone. The finish of this foundation is beautiful and natural. Honestly, I was expecting more of a "powdered" looks since it is a cream to "powder" product. On me, the finish looks natural and ever so slightly dewy. Am I missing something? I really love the finish! I found this product to have average wear. I did not find it to be incredibly long wearing as there did seem to be some fading of coverage by the end of the day. 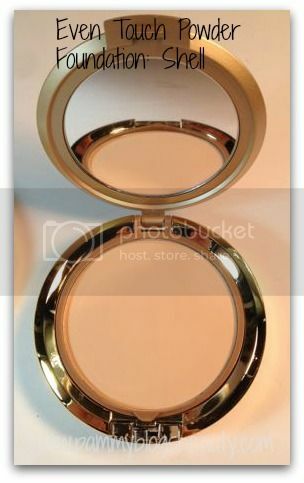 This product comes in a sleek gold compact. 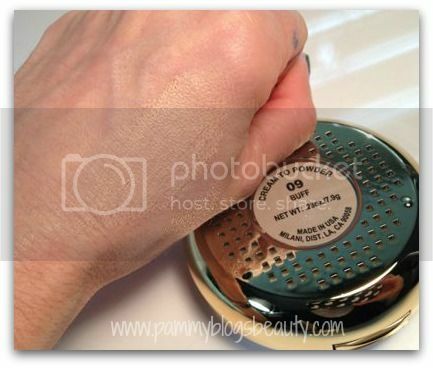 There is a mirror in the lid and you can lift the product pan to reveal a sponge (that I don't use). The packaging looks totally high end! The best part? This product is only $7.99 at your local drugstore. Milani's Even Touch Powder Foundation comes in 11 shades, 3 of which are totally new: Shell, Fresco, Natural, Beige, Warm Sand, Caramel, Creamy Cocoa, Warm Toffee, Natural Tan (new), Creamy Beige (new), and Golden Beige (new). I tested out shade # 01 Shell. While I love the feel of the product, the shade is a touch too dark for my super-duper fair skin tone. I found this to be a bit too dark on me and a bit too yellow. However, I am very, very fair. If you have light or light-medium skin, this shade would be nice for you. If Milani came out with a shade that was just a bit lighter and more neutral toned than Shell, I would have a rival to my Holy Grail MAC foundation. This is a very light and velvety oil free lightweight powder. 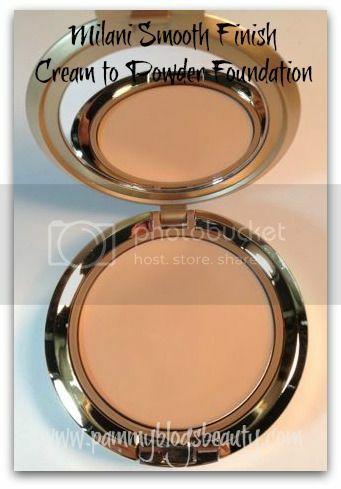 The product feels incredibly smooth and has a bit of "creaminess" for a powder. 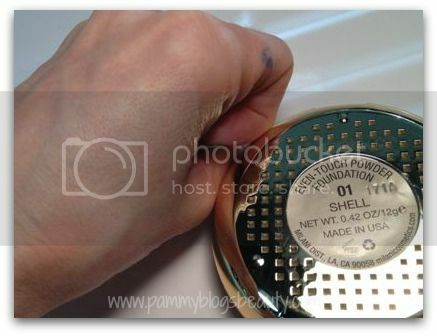 It is somewhat reminiscent of my beloved MAC Studio Fix powder foundation. Actually, this is the closest drugstore product that I have found in comparison to the MAC Studio Fix (that I wear almost every day, My HG powder foundation). I just dust on a light amount of powder with a fluffy brush or large kabuki focusing primarily on the t-zone and blending outward. You can also use this over liquid foundation to help set it. The coverage is really good as is the staying power. Again, I just wish that the shade worked for my fair skin! This product is packaged exactly like Milani's Smooth Finish Cream to Powder makeup. Actually, I wish that they were packaged a bit differently as I always seem to grab the wrong product (depending on what I am reaching for at the moment, lol!). This product retails for $7.99 at the drugstore. Hope you enjoyed this review! Thanks for reading!!! OMG!!! I super love the packaging for it looks so elegant and classy. I also love the shade for it matches my skin tone. I will def grab one of this and I just can't wait to try it out. I will definitely try this! I have very pale skin with neutral undertones so foundations are usually too yellow or pink so it's difficult to find a foundation.